Can get fixed V4 shoes on Genesis if this option is available? I have Genesis. Now I fit and transfer a bodysuit to it (different polystructure around the foot). Now it has all the bones from Genesis. Now I select the suit and then choose the V4 shoes, and It fits perfectly in preview before the "what figure was it originally designed for" menu appears. But it cannot be applied because it is not a supported item when the menu appears, only Genesis is. So you have to cancel the fitting process. Is it possible to have your clothing items that have been applied to Genesis populated in that list? If so then the shoes can be applied to that instead of Genesis and will wrap around its poly structure. They have Genesis bone structure already since it has been fitted to it, so if the shoes can be applied to a clothing item where the polygons are smooth around the foot IE a bodysuit, then that will solve the issue. But since it can only be applied to Genesis, its a no go. Any thoughts? Will this work if it could be done? It must be done here because the shoes snap into place. That list is all of the clone morphs you have installed into Genesis, to get it to work with clothing you would need to create a set of clones for each outfit you intend to use like this. I was thinking just a bodysuit to fit the shoes, and set its opacity to Zero. You wont have to apply this it to all clothing. The suit will be the shoe fitter when ever you use V4 shoes on Genesis. So you wont see the suit, but the shoes are fitted to it.. Fit the shoes to the bodysuit instead of to Genesis. Thats what I want to know..and also if it is possible..
What happens when you tell autofit that the shoes are a bodysuit? I think going with the thigh high boots is a better option, no? From reading this page of info I don't see much that's going to help get Gen 4 shoes fitted to Genesis. For some reason shoes just do not reform well since Gen 4's default loadup is NOT regular foot, it's more of a pointed foot. What we need is a script that somehow will set the feet for Genesis perfectly for all the Gen 4 morphed characters. I tried doing the opposite of setting up the Gen 4 shoes to exact Genesis feet stance and well... the transfer, while it worked, was very much a mess still. There HAS to be a way to figure this all out. A way that's not going to loose material zones or needed morphs included in the shoes/boots! From reading this page of info I don't see much that's going to help get Gen 4 shoes fitted to Genesis. No autofit to genesis, is autofit to a special bodysuit. Bodysuit for genesis need then a clone bodysuit from V4. If the new bodysuit's geometry works or not is another matter. For some reason shoes just do not reform well since Gen 4's default loadup is NOT regular foot, it's more of a pointed foot. What we need is a script that somehow will set the feet for Genesis perfectly for all the Gen 4 morphed characters. If special bodysuit idea is successful, why not a pointed or tiptoe bodysuit idea? Also, a script will be a very nice solution !! The mesh of the V4 clone is posed exactly the same as the Gen 4 V4 in zero pose. However the bones are not, they are in Genesis default pose. I didn't know how important that was, but I thought it might be one of the problems. I did try to adjust the rigging, but that caused the clone to lock up, but I think I may have messed up the freeze when I did it. But after thinking it out and reading the clones .dsf file, I figured the clones are just used for the shape, the template is used for the rigging, weight maps and face groups. 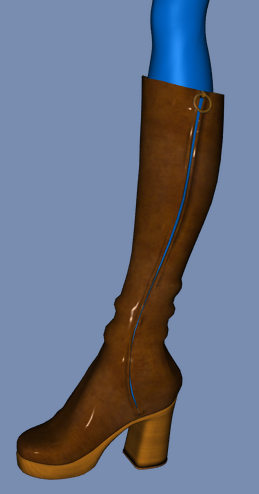 The template for 'Boots Thigh High' is a full footed mesh just like a thigh high sock, so it would be the one to use for 'flat footed' shoes. 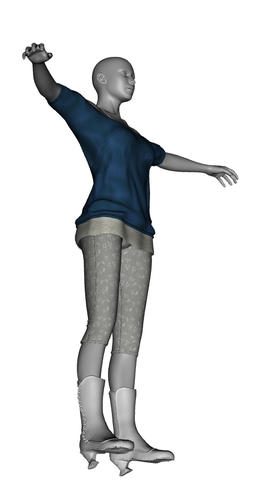 The 'Body Suit' template has no mesh or weight maps for the feet. The main problem for any form of 'heeled' shoe is that the template cannot project the maps from the flat footed mesh around the heel. That's what appears to cause the crumpling of the heel, as it try's to extrude the weight maps out of the bottom of the foot. The toe crumpling I believe is being caused by the extra 'Big Toe' bone in the rigging and it's associated weight maps. I had made a template with a 'heel' and some of my early tests were promising, but one thing that I was still trying to work out was accounting for various heel heights. With Auto-Fit, I didn't solve the 'toe' issue because I didn't mess with the clone at that time. However, using a different source rig in the Transfer Utility that did not have the 'Big Toe' bone, I did fix the problem with the toes. I also tried using the source rig as the fit to figure for Auto-Fit, but without a clone it didn't work to well. From what I learned I think what is needed is a new template for 'heeled' and 'flat' shoes that does not have the 'Big Toe' bone, and maybe also needs to be 'posed' in the V4 default pose. Also a 'form figure' to use instead of Genesis when converting with Auto-Fit, that has an associated clone figure to use. Just a question. Doesn't it work to a certain degree at least if you use the CCT and use the Boot template and reverse from V4 as source figure? I had some success for shoes without heels. For what I've tested the problem with the heels is that the heel part should stay rigid but it is not the case. And I don't see how you could solve that either with a bodysuit or with a template as the heel are not the same from one model of shoe to another. I had some success for shoes without heels. For what I've tested the problem with the heels is that the heel part should stay rigid but it is not the case. That does work to some degree with flat shoes, however, and what many may not notice, is that the Transfer Utility doesn't always, if ever, remove the existing leg bones. This is because in Gen 4 the legs are attached to the hip not the pelvis. This generally doesn't cause problems, but is messy IMO. 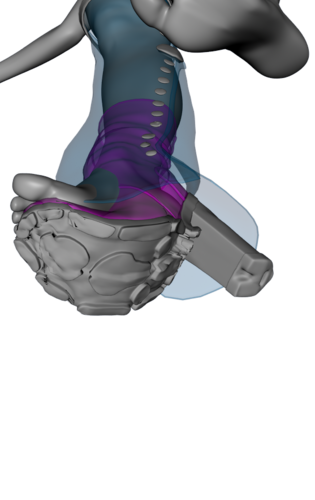 As for the heel being rigid, that's part of the weight projection problem, the heel needs to have full weight. The flat footed template doesn't seem to be able to extrude the full weight of the maps out far enough to cover the heel. The mesh that is outside of it's reach is then 'sucked' back in towards the foot causing the mesh distortion. And this can not easily, if at all, be painted out. I even tried morph targets early on to see if that would work, but the existing maps just crunched them down like the original. And I don't see how you could solve that either with a bodysuit or with a template as the heel are not the same from one model of shoe to another. And that was one of the problems that I encountered before. The heights, widths, shapes of heels can very, and would most likely need several differing templates to choose from. But finding a nice compromise at least for the standard shapes would be ideal. Awww.... :red: , Thank you.... I'm glad you found it useful. I'm in the process of up-dating / re-writing it for 4.5 and to make the process even easier. And I intend to include weight-mapping and making JCM and FBM morphs. Maybe even a section just for converting Gen 3 and 4 shoes if someone doesn't find a easier solution. Yep. The Sickle Super Clip Fixer is for fixing clipping on layers of Genesis clothing, not for conversion. It doesn't actually cover the feet or hands. I made it because I had bought several items for Genesis and could not use them together because they were not morphed for easy layering (especially tops that didn't go with different pants or skirts). The problem with shoe conversion is that V4's toes are pointed when zeroed and Genesis' are flat. No automation is probably going to get around this, unfortunately. Well, okay, not NEVER. I'm just saying, it's usually a safe bet that doing it the hard way gives better results than doing it by one-clicky scripty things even when those scripty things are very fancy. Although Dimension3d seems to be an important exception. I'm still hoping he'll come up with a Ds4/Genesis version of his clothing mirror script. That thing was awesome and it worked perfectly every time. Now if D3D got involved it would be solved in a nano second. I mean the minute that Genesis hit his first transfer product was on the market in like a week and shortly after that DAZ invited him here. He's got one of those minds I guess. I'm working with your more than excellent tutorial too!!! I try with v3 heels. I still have problems with toes, and regardless I obtain a good fit with genesis, some shapes, like toon shapes, destroy the shoe tip. My first solution was to increase smoothing iteration, but this also destroy the shoe. Now, I'm testing with push modifier, collision iterations to zero or one, combined with smooth iteration, with some good results, but I even need to hide toes. If you include weight-mapping and morphs it is a great great great aid to me (us). The zev0's bodysuit idea also can be useful for genesis shoes in extreme shapes. I recommend to experiment with push modifier or something like this. 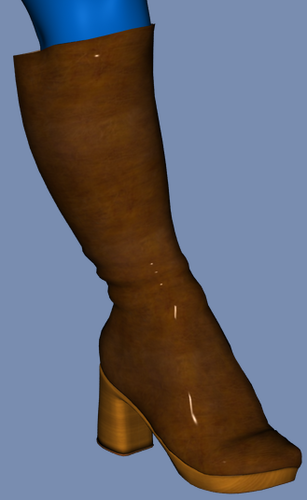 Another of the problems with the toes is that the original shoe was modeled for a specific figure, ie: V3, V4. Re-fitting for Genesis will look best on the equivalent Genesis shape, but any shape that has a similar foot shape will also look good. The problem with some shapes (toons) is that the shapes also change the feet and toes. This results in mostly the toe area of the shoes distorting as the shoe tries to fit the foot shape, but also the sides of the foot may start to bulge out of the shoe. This is where morphs are needed to replace the Auto-Generated morphs that fitting to Genesis creates. Even if a Auto-Fit solution is made for foot-wear, this would still be a problem, just as it is with some other clothing items. Another issue with some shape morphs can be hidden JCM's on the feet that have Auto-Follow enabled. These will also cause distortions to the shoes and would need to be turned off. One fix for the toes poking out the sides of the shoes is to see if you have a 'Toe Morph' or 'Feet for Shoes' morph on Genesis, or something similar. Also you can use deformers on the toes and use the 'Side-Side' for the big toe to move it in. The 'Push Modifier' on the shoes works to a degree, however what it does is inflate the entire shoe, including the heel. Now this generally looks okay on the toon figures as it sort of fits the style, but doesn't look all that good on a realistic figure. I'm trying to be very thorough on the new tutorial, using allot of pictures and explaining the steps in an easy to understand way, and in the easiest way possible. So it's taking quite some time to do. The tutorial I did before I put together in one night without sleeping, and I even left out the last step. Thankfully, someone pointed out that something seemed to be missing, and I quickly put up the revised version. I don't want to make that mistake again... %-P The unfortunate part is that I don't have allot of time available to work on it, so it's been taking awhile to do. Is the problem simply the pose Genesis is in, or is the the actual position of the zero? If the former case, you could simply pose Genesis in the V4 zero pose. This is the principle PoseMaster uses for transferring poses between figures - it has "zero pose offsets" that it applies between figures. If this is the case, I might be able to do something using the PoseMaster offsets. In the latter case, can't you reset the "zero" position using the property editor? I know you can reset max and min using the editor, so why not the zero? Now I haven't experimented to test that. It's a question worth asking. I'm not sure if Transfer Utility or Autofit won't just zero things itself before acting on them. Shoes for V4 have to be ABLE to be posed flat-footed because V4 has to be able to do that. I think part of the problem may be that people are trying this with high heels that are never meant to be flat even on V4, and that may complicate things further. I'm not sure how that would explain the inevitable toe distortion on flatter boots and sneakers, though. That is puzzling. Now, the shoes that I want to fit to Genesis are V4 heels, but the heels have morphs to make them higher or lower, so when I load them on a standard V4 in the zero position, they come in looking like a heel on a flat-footed pose. Very silly, so I have to re-pose the feet, and the toes, for them to work. I haven't yet tried fitting them to Genesis to see how bad the situation is, but even at the lowest heel setting (which is quite moderate), I have to re-pose the feet on V4. I tried niccipb's conversion with free nancy boot for V3. 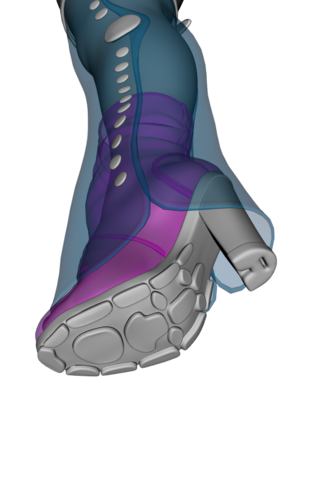 First image is the v3 boot, second is the direct autofit to genesis, third and fourth are the conversion boot+ smooth+push autofited to genesis with extreme toon foot, amy and chibi girl. Only big big toe of chibi boy was a problem for this conversion. Curiously, this boot have only one face group defined for right side: "rfoot" , no rtoes, no rleg face group as you can see in the fifth image. I had totally successful and fast conversion with two heeled boot, in both cases only rfoot face group is defined. In another case, conversion had several problems, and it wasn't satisfactory. That's weird that that happened, but it looks like you did get a nice-looking result out of it. I will try with another shoes, with single and multiple face group to see if this is a consistent statement, or only a casual event. That is indeed very odd that there is only a single face group. The Figure Setup pane should read all of the face groups that are defined in the original .obj and should not affect them in the created figure. If you used the Transfer Utility to transfer the weight maps, this to should not affect the face groups. There were bugs in 4.5 with the Figure Setup tools that could cause a crash when adding geometry to the skeleton and some in the Transfer Utility that had to do with projection, but I don't know if that has anything to do with this though as I haven't had that or what you encountered happen. Huh. Sometimes, the antcipation is worse than the problem. So, here are some V4 boots run through autofit to V4 Genesis. No, they aren't perfect. The soles are slightly crumpled. The soles of the heels are slightly crumpled. But other than that, the fit is as good or better than a direct load onto V4. I can work with this, At worst, most of the problem would be easy enough to shoot around by a bit of care in posing, and the rest would probably be fixable in post. Will be interesting to see whether some of the other shoes from this artist are as well behaved. Not bad at all. Especially since they're an adorable boot. 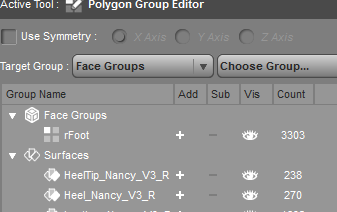 I haven't others "single face group" shoes for now, then I only work with a "multiple face groups" shoes. In general, conversion was successful, so, my previous guess is not true, then face groups doesn't influence conversion performance. These are Leopard shoes (http://www.daz3d.com/shop/leopard-shoes/) for V4. First and second are autofit. Third is corvesion fit to genesis. Fourth and fifth are genesis shapes, chibi girl and V3 respectively, they need 20 smoothing iteration and 5 collisions to repair destructive big toe effect.